Chile’s wildlife filled beauty is the essence of what makes Chile one of the most spectacular places on the planet. The diverse nature and culture of Chile makes it a wonder to explore. 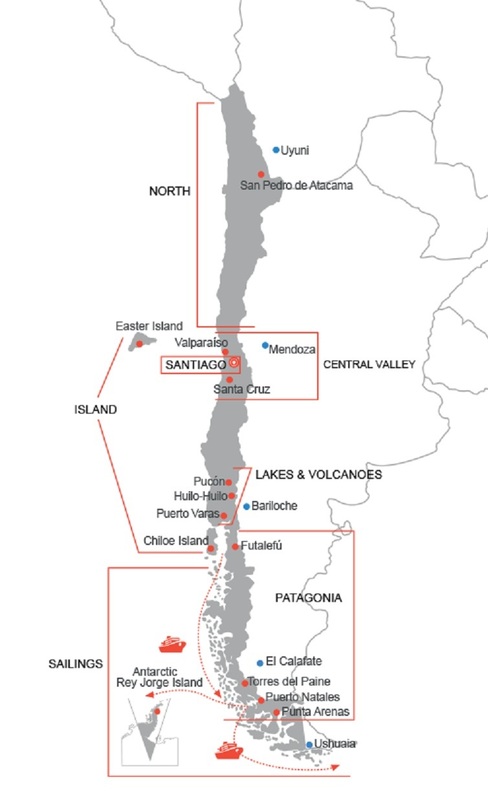 Chile’s vast un-spoilt wilderness stretches from the north, through the driest places on earth in the Atacama Desert with its Geysers and Salt Flats through the bustling cosmopolitan city of Santiago, to the breathtaking Patagonian glaciers in the south of the country. Chile is a unique and diverse country. In the north in San Pedro de Atacama Desert you can visit Geysers, Salt Flats or the Observatories. Five hours flying time to the east of Chile lies the UNESCO World Heritage of Easter Island with its Ahu’s (altars), Moai (stone heads) and cultural heritage. The beautiful capital city of Chile Santiago is vibrant and diverse surrounded by the spectacular Andes Mountains. It is steeped in history and has many museums, art galleries and lots of shopping opportunities. On Chile’s central coast are the cities of Viña Del Mar and the UNCESO World Heritage site of Valparaiso with its multicolored wooden homes and rich culture. Towards the south of Chile is The lakes District near Puerto Montt and Puerto Varas. This is a tranquil and peaceful oasis from the world with mountains, lakes, waterfalls, spas and volcanoes. In the south of the country Patagonian’s unspoilt wilderness and Torres del Paine National Park will take your breath away. . The North of Chile is best visited during the months of June to September when the heat is not so intense. Travel to the South of Chile is best in December to March (summer). Torres Del Paine National Park is open all year round, but due to snow and daylight restrictions in the winter where only day excursions are possible, and much of the transport is restricted. The Lake District can be visited between October and April, but the most pleasant weather is between September and November (spring). Santiago during the summer it is very hot (December to February) and in the winter (June to August) can be warm but a little smoggy.